The chronicles of a hippie mom's journey towards becoming a work-and-earn-from-home virtual assistant/entrepreneur. It's been awhile since I updated this blog as so much has happened -- doors of opportunity opened up for me. A few days before the end of 2010, I submitted a short 'story' to my VA and Online Marketing mentor, Jomar Hilario, on how my life has unfolded and revealed to me possbilities, potentials, and realizations of what it's like to be a Virtual Assistant. I gave myself the monicker 'Virtual Mompreneur'. So what is it really like to be a Virtual Assistant, or someone who has virtual clients and works from home (or any other location of one's choice)? Just a sample snapshot: as I am writing and typing this blog post, I am interrupted by my 5 year old daughter asking me to help her open a chocolate bar. Ah..the simple joys of being with family! 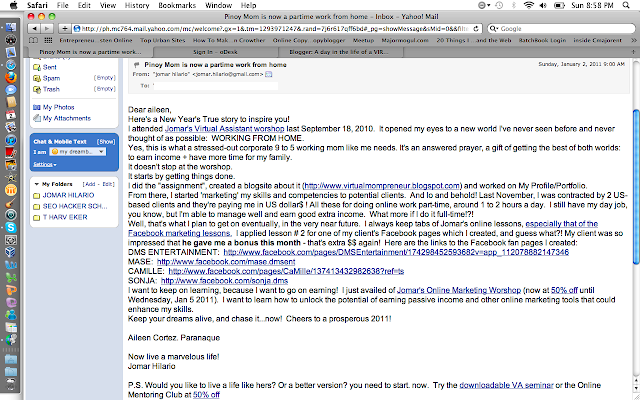 I am grateful to Jomar Hilario, VA and online marketing expert and my mentor, because he gave me a chance to share my story to his newsletter subscribers. Here's a screen shot of this feature; but for the benefit of those who want to read it clearly and access the very helpful links, I've copy-pasted the letter below as well. Here's a New Year's True story to inspire you! I attended Jomar's Virtual Assistant worshop last September 18, 2010. It opened my eyes to a new world I've never seen before and never thought of as possible: WORKING FROM HOME. Yes, this is what a stressed-out corporate 9 to 5 working mom like me needs. It's an answered prayer, a gift of getting the best of both worlds: to earn income + have more time for my family. It doesn't stop at the worshop. It starts by getting things done. I did the "assignment", created a blogsite about it (http://www.virtualmompreneur.blogspot.com) and worked on My Profile/Portfolio. From there, I started 'marketing' my skills and competencies to potential clients. And lo and behold! Last November, I was contracted by 2 US-based clients and they're paying me in US dollar$ ! All these for doing online work part-time, around 1 to 2 hours a day. I still have my day job, you know, but I'm able to manage well and earn good extra income. What more if I do it full-time!?! I want to keep on learning, because I want to go on earning! I just availed of Jomar's Online Marketing Worshop (now at 50% off until Wednesday, Jan 5 2011). I want to learn how to unlock the potential of earning passive income and other online marketing tools that could enhance my skills. Keep your dreams alive, and chase it...now! Cheers to a prosperous 2011! ==================================here's to following and chasing dreams! cheers! The image above is a screenshot from my oDesk notification box sent by a client for the VA job that I applied to. It says " I would like to give you a 30 day paid trial period to see if we work well together. Are you ok with this? If so, how soon could you start? " For almost three weeks now, I've started client hunting over at oDesk. Every aspiring virtual assistant should be familiar with this online hub where job seekers and job employers meet and do an exchange of services. For about a week, I built my resume and portfolio. It's a must for VA's to have a comprehensive resume and portfolio. It's easy. You too can start it now. "I am taking a shot at the moon applying for this post. I still do not have any Odesk work experience. I am sorry if I pursued this, inspite of your specifications to have Odesk work and feedback. Yet, I believe that I have the makings of a "mogul", with an openness to learn, gain and enhance my online skills and be a well rounded team player. ..."
It really pays to be bold and daring oftentimes... For three days now, we've exchanged messages ---throwing more questions at me and asked me to submit a sample work. Now, it's the waiting game...hoping, wishing, praying...no matter what the result is, I'll wear a smile on my face and keep that bold and daring spirit. To pick-up from where I left-off in my previous post, another online testing venue for Virtual Assistant aspirants is Brainbench. Getting a certification from Brainbench adds another feather to your cap, which is your resume or portfolio. One of the initial steps that a would-be / aspiring virtual assistant should take is to build a portfolio or a resume of one's experiences, education/training, work samples...all these elements should give one's prospective client a clear picture of one's qualifications. One of the more effective ways of presenting a virtual assistant's skills and aptitude is by taking online tests that measure one's knowledge and skill that match with a particular job requirement. I am currently building my portfolio at oDesk, a virtual assistant's hub to find online jobs. I am taking as many skill-focused tests as I can so as proof to a prospective employer that my listed knowledge and skills are backed-up by diagnostic test scores. My destination is to be a work and earn from home mom. 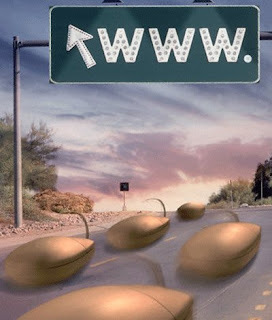 Being a virtual assistant or a virtual entrepreneur is my road. I've got pave it smoothly with my portfolio. You just gotta start somewhere. Start it here, start it now. A virtual assistant may be assigned to coordinate with everyone in the team, make sure that everyone's on track and aligned on a certain project. How do you do this if your team members are on different locations half way across the globe, wake up to different time zones, and juggle a multitude of projects? For those who work 9 to 5 in an office and commutes or drives to the workplace and back home, traffic is such a dreaded word. It is like saying 'Voldemort' in your face. But for the virtual assistant who works at home, particularly those that work with internet based businesses, traffic is like music to their ears. One of the most helpful tools that could help virtual assistants and their clients get a snapshot and at the same time, microscopic view of their website's performance is through Google Analytics. a mom of 2 kids - Ram Cartney and Pennylane. enjoying the balancing act of cool parenthood, of being a 9 to 5 working mom, shopping at ukay2/flea markets, collecting retro stuff... while building my 'mompreneur' business empire.